I will be typing along, and realize I want to link to an extant zettel. I have to go to the search field, search, copy the link for the relevant target, clear the search field, find the note I was working on originally, find my place in it, and paste the link. This is a lot of cognitive overhead and always takes me out of the flow. Nearly every time I use The Archive I miss this feature from @rene 's work. 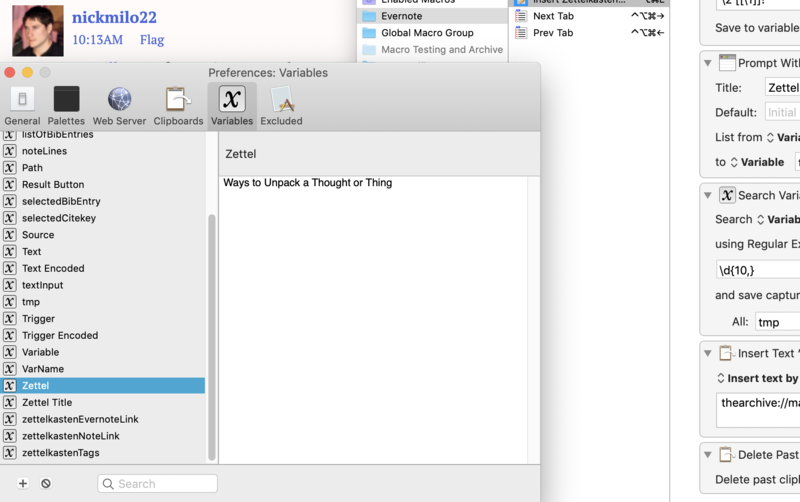 In sublime-zk or sublimeless, I can type [[ while writing and get a pop-up list of all zetteln, which narrows as I type. Then, when I hit return, the correct one is inserted. The [[ trigger is not necessary, a hotkey to bring up an auto-narrowing list would also work. In emacs with zetteldeft I can do the same thing with a hotkey, and that works fine as well. Honestly, this is the number one thing that makes me minimize The Archive and open another app. 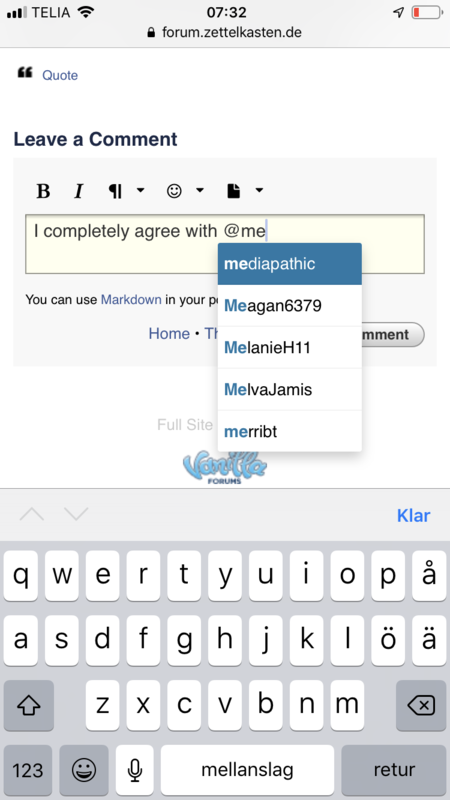 I completely agree with @mediapathic that this feature would be great, and I would like to see a design solution in which, when one types a character like [ or #, and continues to write a letter directly after this, a list like the following pops up. Keyboard Maestro to the rescue! Four macros. The first is triggered by [[ then it does a type ahead search of your notes. Then it places the UID within [[ ]]. The other three are for duplicating the same funtionality with tags. Refresh Tag Varible keeps tract of tags. Refresh Tag Cloud creates a "Tag Cloud" note and finally, Insert Tag is activated by typing the # key with the same type ahead search. Thanks for the inspiration to create these. I'm finding them very helpful already. I'm really an amateur at this Keyboard Maestro but I'm enjoying it so far. I mean, uh, thank you! Thanks, I consider Keyboard Maestro in this use case a crutch till @ctietze's further developments. Hey Will... I just wanted to thank you for sharing your macros. I've been banging my head against the Keyboard Maestro wiki trying to figure out how to do these things. The macros you've put together helped me immensely (both in terms of getting my stuff done and in terms of learning a bit more how to bend KM to my will). Thank you. Credit is shared amongst my teachers and those who inspired me. @kaidoh, @onlyskin, several people for the Keyboard Maestro users forum. And everyone who was kind enough to share tips on Regex. Testers and onlookers. Special thanks to @ctietze for creating this forum and The Archive. Thanks to all of you. @Will Sorry for my ignorance but I was only able to get Inline Note Link to work. Are there a few common stumbling blocks in Keyboard Maestro you may be able to identify and help me overcome? I have changed the filepath from yours to mine; that was easy enough to get Inline Note Link working. @nickmilo22, glad you could get the _Inline Note Link _ working. Is there a specific macro you are trying to get to work? I'll try and help. For some of the macros, there is an expected variable needed that is provided by another macro. One tip that has helped me tremendously is to test the regex part of the scripts in terminal first to be sure that the output is what you want. I found it helpful to keep Keyboard Maestro's preferences open to the variables and keep checking that I'm referring to the correct variable.